SMS based services as those listed above are huge revenue generating avenue for Mobile Operators on top of conventional Person-to-Person messaging. Mobile Operators can easily capitalise on this trend by providing facilities to Content Providers and Application Service Providers so that they can easily create and launch services. A major stumbling block have always been that Content Developers and Application Service Providers are not familiar with conventional SMSC application interfaces protocols such as SMPP as their application developers are typically web programmers. Their core business does not justify getting a resource to do SMSC programming. This will also cause much assistance required by Mobile Operator’s SMSC team to assist the Content Developers and Application Service Provider for the launch of new services. Mocean Mobile Content Delivery Platform is ready solution that solves this problem. It enables Mobile Operators to provide web programming interface (HTTP/HTTPS) for Content Providers and Application Service Providers. 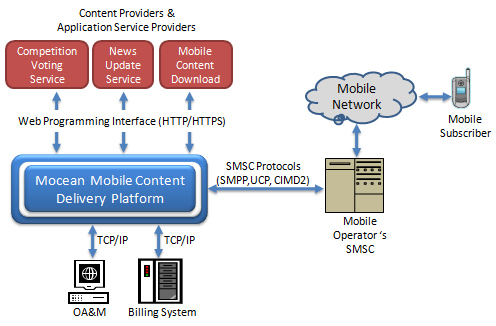 Mocean Mobile Content Delivery Platform will handle the necessary SMSC interface. With Mocean Mobile Content Delivery Platform, Mobile Operators can now sign up more Content Providers and Application Service Provider and encouraging them to launch more SMS based services easily.